To use all AutoQuad ESC32v2 features calibrations are required. The calibration meassures and calculates drive characteristics and must therefore be performed for every different motor, propeller and voltage (LiPo cell count) combination. Note: Don´t use the following calibration methods for ESC32 V3! Use the AQ ECU instead. On a ESC32 V2, there are two different calibrations, the current limiter calibration and the feed forward calibration. The current limiter calibration is required for the virtual current limiter which performs better than the standard PI controller. The feed forward calibration is required for the closed loop control modes (RPM and thrust). Attach your motor with prop on a non movable surface and make sure the motor is attached so it can’t move. use the prop you intend to use otherwise the data will not be valid. Be careful!!! both calibrations will ramp up the motor output to max so use a wide open space without audience presence. Connect the ESC32 using your FTDI interface to the computer and start QGCS. Make sure the AutoQuad widget is visible in the engineering tab. Click on Esc32 Settings. 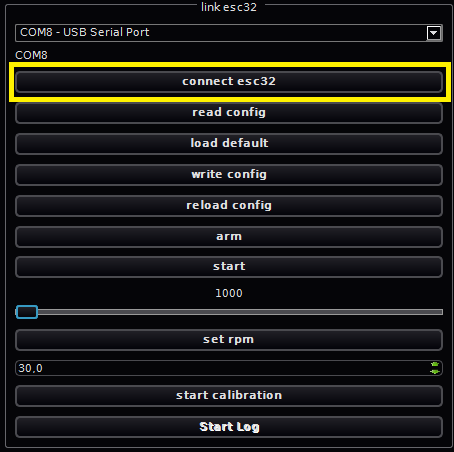 Proceed with connecting the esc32 by clicking on the ‘connect esc32’ button. That one! !, make sure you did NOT use any other connect button only that one. To set the maximum current to use in the calibrations you can adjust the default (20A) to any number.It will probably be good practice to start low and watch the first calibration. If you table, motor and room is still intact you can set a higher number. Final check and click on ‘start calibration’. The following warning will be displayed. Next you can select the two calibrations. Select the one you need (or do both). The calibration will now start and take some time. 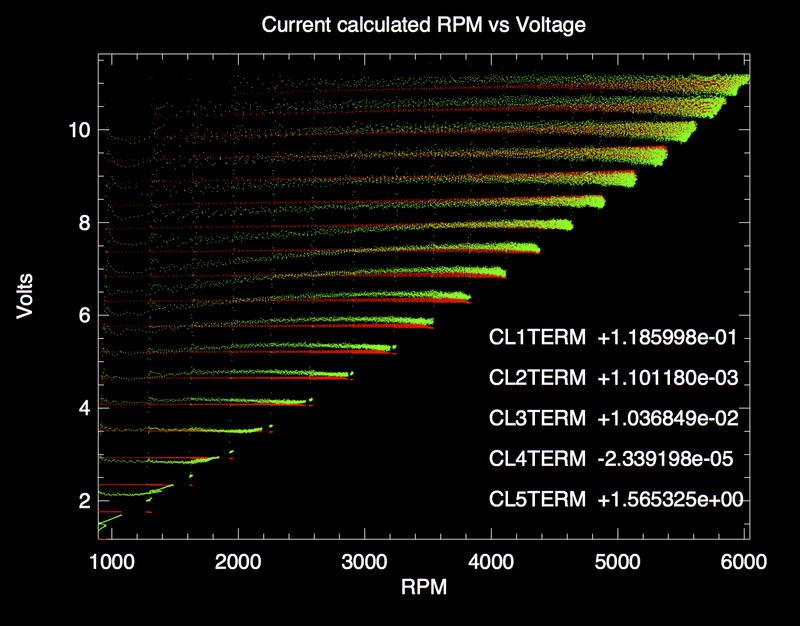 The calibration sequence will ramp up the duty cycle in several steps and measure rpm, current, duty cycle and voltage. It can produce output like this if you graph the data (next versions or if you use the linux version with plplot). In the current QGCS a comma separated file is generated in the QGCS directory that can be imported into a spreadsheet program. 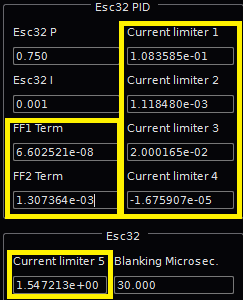 After the calibration the current limiter (1-5) or FF (1-2) data is displayed and entered in the Esc32 PID screen. Now click on ‘write config’ to save them to the ESC32 memory. 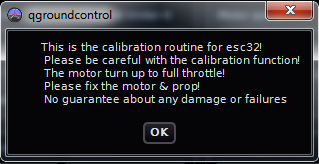 You have to manually enter the calibration data in your other esc32’s. When using the QGCS, the executables for calibration are in the software, but when using the commandline binaries on linux or OSx you need to compile them. After the next login esc32Cal can be run as normal user. Note: The warnings can be ignored! The device port (-p switch) must be set and depends on the used converter (“dmesg” can help to indetify the port). It’s important to limit the maximum current (-a switch) to match the drive combination (motor/propeller/voltage). A value to high can burn the motor or ESC! Ctrl+C can be used to terminate esc32Cal. This page was created on 18-Jul-12 by menno. Last modified on 24-Aug-15 by kinderkram.